I’m back home now, after spending a week on Cape Code to visit family. There was a lot of beach time, like you’d expect. And of course I got almost no reading done – also like you’d expect. Needless to say, my visions of being able to stretch out on the warm sand while basking in the sun with my nose in a book were swiftly replaced with the reality of chasing after my kids all day long, making sure they didn’t get into any trouble. On the other hand, I was quite productive when it came to audiobooks, thanks to the hours of listening time on the long drives there and back. Hopefully it won’t take too long for things to ease back into their normal schedule now that I’m home, because there will be another big shakeup to my routine once September rolls around and my oldest starts kindergarten. Time sure flies, doesn’t it! When I came home there were a few surprise packages waiting for me. Inside one of them was Jade City by Fonda Lee which is actually a book I’ve been looking forward to, so I couldn’t have been more pleased to get a copy, with thanks to Orbit Books! Inside another was a finished copy of The Massacre of Mankind by Stephen Baxter courtesy of Crown Publishing. 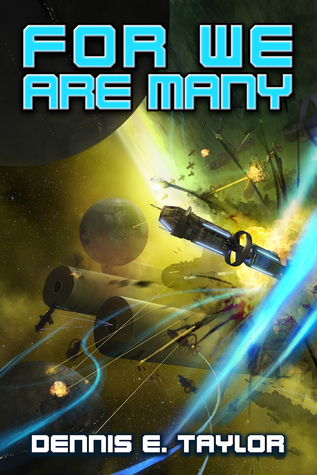 In case you missed it, I reviewed this official sequel to The War of the Worlds earlier this week, and you check it out here. 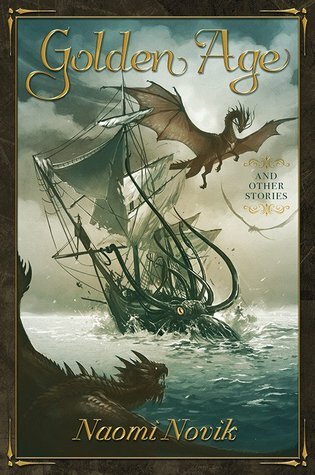 Next up is an ARC of The Sky is Yours by Chandler Klang Smith from the awesome folks at Hogarth Publishing. 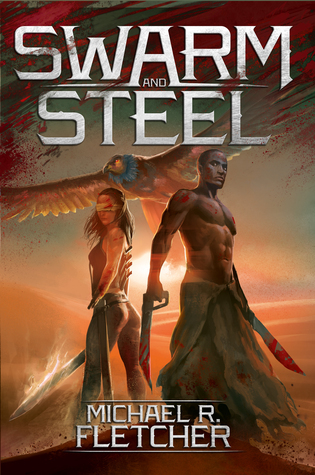 I hadn’t heard of this one before, so I looked it up right away, discovering that the story is a bit of an oddball mix of epic fantasy and sci-fi dystopian. With that quirky cover calling to me, I think I’m going to have to give this book a shot. Apparently, it also has dragons! 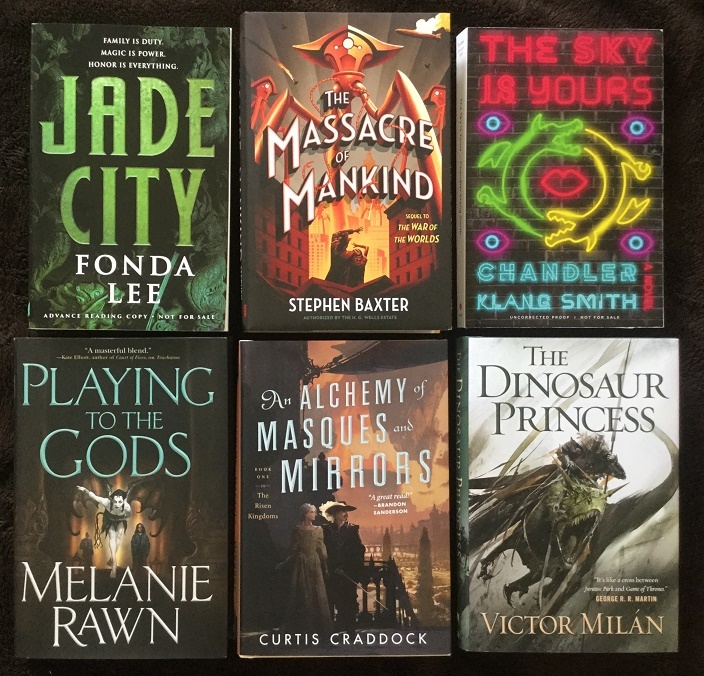 From the wonderful team at Tor Books, I also received a treasure trove of new books this week. 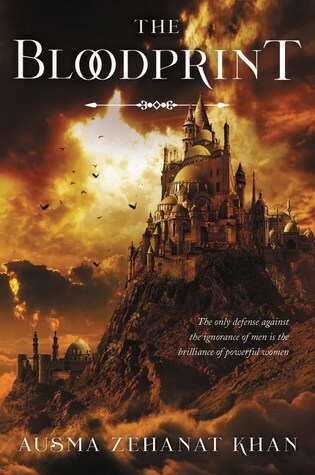 First up is Playing to the Gods by Melanie Rawn which unfortunately is listed as the fifth and final book in her Glass Thorns series and I haven’t read any of the previous installments. Since Rawn is an author I’ve wanted to read for a long time though, I know I’ll eventually find a good jumping on point to try her work. 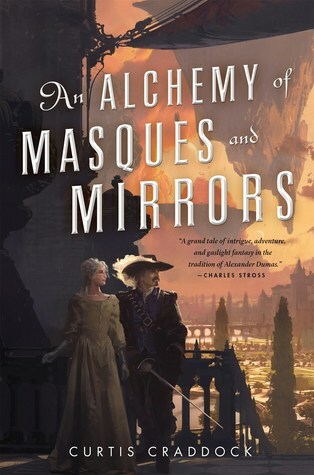 I also received a finished copy of An Alchemy of Masques and Mirrors by Curtis Craddock, which I’ve already read and LOVED! Be sure to keep an eye out for my review in a few days! And I was also thrilled to receive a finished copy of The Dinosaur Princess by Victor Milán, book three in the Dinosaur Lords sequence. I’m still enjoying this series, but things got a little shaky in the last book so I’m hoping the story will pick up again in this one. The Tor Books haul continues with a couple of their titles from their Tor Teen imprint. Ferocious by Paula Stokes is sequel to last year’s Vicarious which I have not gotten the chance to read yet so I’ll have to catch up before diving into this one. I also received a surprise ARC of The Dark Intercept by Julia Keller, a YA sci-fi dystopian which admittedly sounds a bit derivative from its description, but I’m nonetheless very curious to try it. And speaking of books I want to try, The Castle in Cassiopeia by Mike Resnick is the third novel in the author’s military sci-fi series called Dead Enders. I don’t know if I’ll ever catch up with previous books considering the amount of reading already on my plate, but I’m definitely going to keep them on the list. Next up is an ARC of The Nine by Tracy Townsend, a book I’m highly anticipating. It’s on my must-read list for this fall, so I’m sure you’ll be hearing me talk more about it in the coming months. With thanks to Pyr Books for the review copies! An finally, rounding out my new arrivals in the mail this week are a couple of unexpected but drool-worthy ARCs courtesy of Thomas Dunne Books. One of Us Will be Dead by Morning by David Moody caught my attention with its title right away, but the description is even more intriguing. 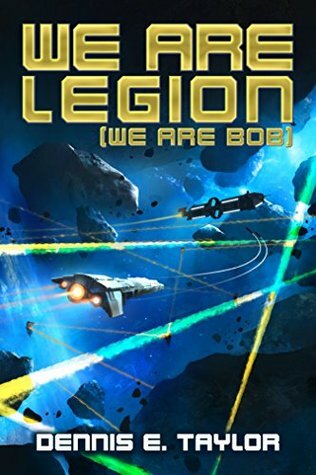 The thing is, the book is listed on Goodreads as the fourth novel in the Hater sequence, though I’ve also heard the first three books called the “original trilogy”, implying this might be a standalone or start of a sequel series. If it turns out I can jump on board right here, then you can be sure that I will. Last but not least is Glass Town by Steven Savile, a novel of magic pitched as “reminiscent of Clive Barker’s Weaveworld and Neil Gaiman’s American Gods.” The author has also been a writer for popular TV shows such as Doctor Who, Torchwood, and Stargate, so I have a feeling that this book, described as his US debut, should be very interesting! Moving on to the digital book haul, I was emailed about The Bloodprint by Ausma Zehanat Khan earlier this week, and after researching it a bit, I found that I could not resist its gorgeous description and decided to accept it for review. 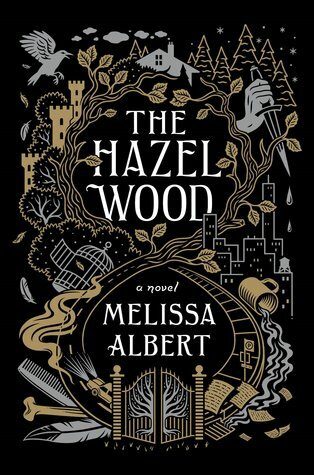 From NetGalley, my request for The Hazel Wood by Melissa Albert was also approved this week, to my absolute joy and delight. 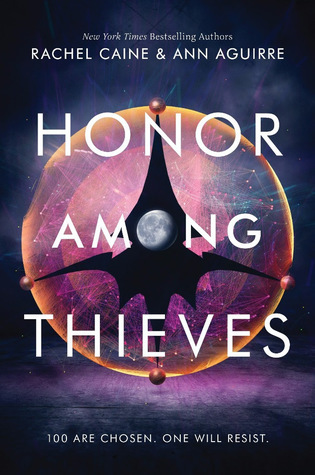 A couple of YA digital ARCs also came in from Edelweiss, first An Enchantment of Ravens by Margaret Rogerson and then Honor Among Thieves by Rachel Caine and Ann Aguirre, both of which are books I’m champing at the bit to read. With thanks to Harper Voyager, Flatiron Books, Margaret K. McElderry Books, and Katherine Tegen Books for the review copies. 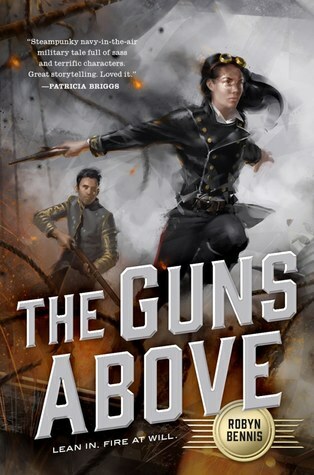 I was also happy when I heard that the audiobook of The Guns Above by Robyn Bennis will finally be released at the end of this month. 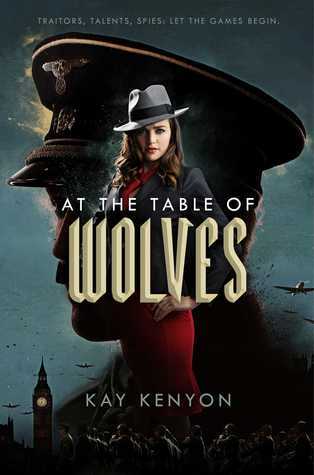 My thanks to Macmillan Audio for offering me a chance to review it. 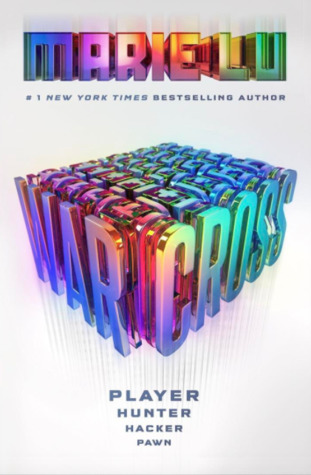 Another audiobook that caught my eye was Warcross by Marie Lu, an upcoming YA release that has been getting tons of buzz lately. I decided to check it out, with thanks to Listening Library for the review copy. 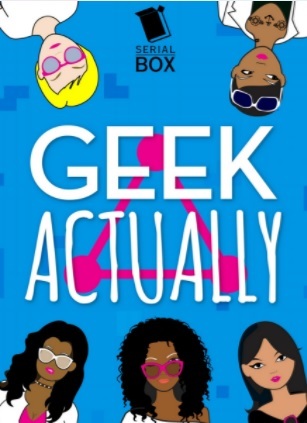 And with the finale approaching for the serial Geek Actually by Cathy Yardley, Melissa Blue, Cecilia Tan, Rachel Stuhler, I was recently contacted by the publisher Serial Box with an opportunity to review the entire first season in audio, which I gratefully accepted. This series has been on my radar for a long time, but as with all serialized releases I always prefer to binge the entire thing in one go, so I’m fantastically excited that I’m soon going to be able to do so with this one. Here’s what I’ve “unstacked” from the TBR recently. Reviews are coming soon! I read David Moody’s Hater series. It’s like a zombie apocalypse novel with a twist on the zombies. Pretty good. I might have to check out this new one. I’m not sure calling them zombies would be entirely correct. Ah, like mindless husks, that kind of deal? 🙂 Now I’m doubly intrigued! Not really. The world is divided by “Haters” and normal people. “Haters” hate normal people and attack them in a lunatic frenzy. They don’t eat them and are not contagious. Haters keep their intelligence but can’t control their hate. They can attack and kill family members. Even their own children. The trilogy follows one man who becomes a “Hater”. Wow. That sounds insane…in the good way! Doubly interested in checking this out now, thanks! Oh wow!! Awesome haul!! Not sure how my request for The Hazel Wood is doing. It seems they like leaving me in suspense! Some great looking reads there! Hope you enjoy them all! Yeah, I heard someone else was waiting for their approval! Maybe they’re doing it in batches! If you ever feel the need to read more of him, I recommend his Santiago duology. I have a feeling Geek Actually is going to be really good in audio. The characters are a lot of fun, and the little I read had the feel of sitcom TV, so the audio should rock! I’ve had a request in for The Hazel Wood for a while, hoping I get approved soon too:-) And finally, I’m about to finish up An Alchemy of Masques and Mirrors, and all I can say is WOW. Happy reading to you too! I’m really looking forward to all of those! I have One of Us Will Be Dead by Morning on my list. I didn’t know it was a book 4, though. I’m curious to hear how stand alone it is. 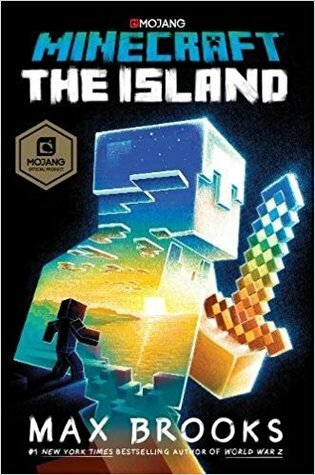 I also want to know if the Minecraft book is something a Minecraft kid would enjoy. I really hope One of Us Will be Dead by Morning can be read as a standalone, because the more I learn about it, the more intrigued I am! I’ve also got ARCs of Jade City, The Bloodprint, and An Enchantment of Ravens! 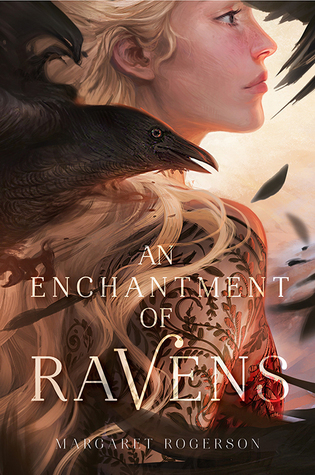 In fact, An Enchantment of Ravens is the book I plan to start next. Awesome! You’ll probably finish An Enchantment of Ravens way before I do then (probably even well before I start! ), I look forward to hearing your thoughts! I wouldn’t say it’s over the top. Just a bit too familiar. 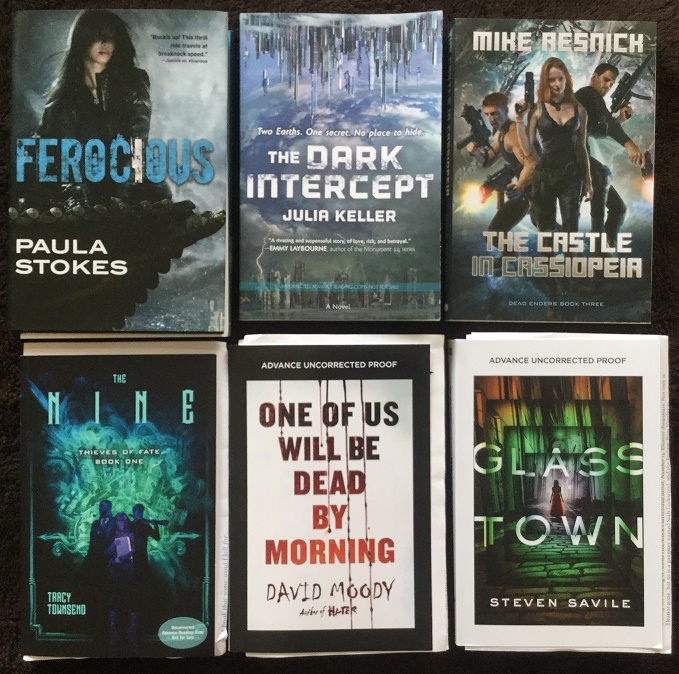 You’ve got some good looking SF books here, I see a few I might need to add! Jade City and The Massacre of Mankind are two Im interested in, and maybe One of Us Will Be dead by Morning. I need to go over and check those and a few of the military SF ones on here as well. Yay for lots of SF coming out! I’ve gotta say thanks for this post, I’m now reading An Enchantment of Ravens because of it! When I saw it mentioned as one of your recent edelweiss arc’s I couldn’t remember if I had requested it there or not and went to check. Low and behold, not only had I already requested it but had been approved on 8/16! I must have missed the approval email somehow. I started reading as soon as I got it downloaded to my Kindle app and so far I absolutely love it. So thanks to you for all your posts but especially this particular roundup! The two that caught my are The Sky is Yours (because I’m always curious about genre mash-ups) and Glass Town (because I love all those TV shows)! The Bloodprint is already on my TBR – I’ll be really interested in how you like it and also look forward to your review of The Golden Age! Oh man. I always feel bad for vacationing parents with little/younger children. I couldn’t do it! But then, I don’t have kids. O_O I’m so curious about The Hazel Wood! The cover is gorgeous and the book sounds great too. I hope you enjoy all of your new books! We always think that holidays are going to be great for reading but it never happens! Too busy doing fun stuff all day, too tired at night! I never get anything productive done! I’m not a fan of David Moody as an author and didn’t like Hater so I hope you have a better time with the series! Next year when time allows I might go into fantasy a bit more, see if I can find something similar to Game of Thrones to read! As for your new books, I’ll be eager to read your thoughts on An Enchantment of Ravens once you read it. And I’m about 120 pages away from finishing The Stone Sky by N.K. Jemisin… and I do NOT want it to end, for many, many reasons. And yeah, we go to the Cape all the time because my mother-in-law lives there. She’s in the quiet residential areas too so it’s not so bad, but ack, every trip into town during the day takes forever because of the heavy traffic. No such luck. This afternoon’s whale watch was already sold out by this morning. But we went on a tour of one of Bass River instead, which goes through Yarmouth and Dennis and empties out in Nantucket Sound by Bass River Beach and West Dennis Beach. I’m going through my pictures from it now. 😉 We’ll get to do a whale watch another day, I’m sure. Aw that’s too bad! And I know what you mean, my husband and I were just recently lamenting about how getting on and off Cape Cod is a pain during summers because all cars have to go through one of those two bridges. His parents retired there but before that his grandparents did too, so he’s had years of experience vacationing on the Cape. He said that the infrastructure has literally remained the same for the last 20-30 years except the population has grown by tens of thousands and it’s too late to do anything now that everything’s all built up! Glad you had a nice vacation. I always plan on doing a lot of reading when I am off and then usually that never happens. I had a pretty hectic weekend. It was fun and we managed to go target shooting, took the pups to see Grandpa and watched some preseason and college football but it means my blogging and reading slipped. You have a lot of good looking books here. I’m hoping to get a bind up of the Geek Actually story when it releases. Yep, I never get any reading done during vacations, as much as I try to convince myself this time will be different! But guess we’ll all have to get our outdoor activities and fun in before the summer ends! What a great haul. Some great sounding books on here – especially I love the sound of Hazelwood, An Enchantment of Ravens and The Nine. I have all the wants. Yeah, those are among my most highly anticipated books for this fall and winter! Whoops – lost my comment! Hazelwood, Enchantment of Ravens and The Nine are calling to me. For sure! The Hazel Wood especially!